Reviving the Islamic Spirit. What Is This Spirit? Conference: Reviving the Islamic Spirit. What are Islamic beliefs? Facts about Islam? Truth about Islam? 2 posters. Reviving the Islamic Spirit - Big Conference. So, what is this spirit? And what are Islamic beliefs? Here - 2 quick and clear reminders. Hadas - throat slit. 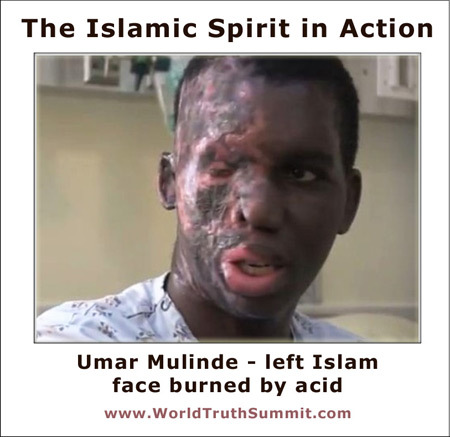 Umar - face burned. It was hard for me to stomach. Not only was the conference being put on - Reviving the Islamic Spirit - as if the that spirit were all about things like tolerance. On top of that, the keynote speaker will be a major contender for the leadership of one of Canada's major political parties. I know too much about what's happening with Islam, as it's reviving ever more. Every day, in my inbox, I get JihadWatch - jihad horrors of the day. I also know that one Christian is murdered every 5 minutes for being Christian - close to 100% of the time by Muslims. Okay - so there's more to Islam. But the murderous aspect is huge at the moment - and very rooted in Islamic religious texts, Islamic beliefs - in Islam, the religion. And I am sure this will not be acknowledged at the conference. So I put together a couple of posters. Very simple. Very clear. So, what is this? What are Islamic beliefs? Muslim Beliefs? What's in the Qur'an? What are facts about Islam? What is the truth about Islam?